So this was like 150 pages of historical inaccuracy from the get go. Glad I read this on Kindle so I could look up all the archaic vocabulary. I love when period-appropriate language is used in historical novels, but there has to an emphasis on the appropriate part. It just seemed like there may have been an "English slang from early 20th century and earlier periods" thesaurus in use. Some of the words were used circa the Middle Ages and they were being used in a story ostensibly set in the Victorian era (?!) so I'm... I'm not sure how I feel about that. I lost about two or three days worth of free time to reading old handbooks on appropriate etiquette for debutantes during the Victorian era online, purely because I almost threw the Kindle across the bedroom at certain parts with exclamations of "She can't do THAT! It's too scandalous!!!" -- "She noticed this time that he had a pronounced widow's peak. Maybe this accounted for the sinister cast to his features." Widow's peaks = evil, it's true. See any anime ever, but maybe first try Dragon Ball Z. -- "He went to the card room and promptly lost fifty guineas." WTF, how?! Did you throw it at someone's face? You can't be that careless. That is a ridiculous sum of money. 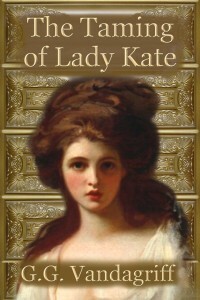 -- "Kate was standing behind his bent figure. Whipping the knife out of her stocking, she held the weapon above her head." I had this hilarious mental image of a gown with the equivalent of hammer-space holes to allow her to be able to do that without alerting the guy she's standing behind. Yeah, those Victorian dresses? Few dozen yards of fabric in the skirt alone, not counting petticoats and undergarments. Ah, magical wardrobes, gotta love them. -- "I am going to remove your waistcoat and shirt, as well. Potter has taken off your boots, but I will leave you your breeches, never fear." / "Are you absolutely certain you have no designs on my virtue or my life?" -- "Yes, and her reward is somewhat dubious. She is to be saddled with me for a lifetime. But it is a sad fact that life is not fair." Where is my period-setting Hallmark movie with this line uttered by a handsome B-list actor? -- "A man need not love a woman to make love to her. But a woman? How could she allow herself to be conquered in the most intimate of ways if she knew the conqueror's heart was not involved?" I suppose I should have known a book of this genre would also follow the usual trashy stereotypes. He likes her, she likes him, but never at the same time or even the same chapter. One is always teasing the other and leaving them sexually frustrated. They have literally known each other less than a week, but that's okay! However, modern views of consent and love of Warm And Fuzzy Feelings means that of course he shall not force himself upon her when he thinks she feels nothing for him, husbandly rights be damned! Of course she will vow to remain celibate in a loveless marriage for eternity to save her younger brother because self-sacrifice is the epitome of unrequited love/lust! Sigh. At least the author realized this and poked fun at the tropes throughout the text, or at least I hope that was intentional satire anyways. -- "It's the newest [revolver] I have. Releases several shots at once. Especially suited for self-defense, but not good if your mark is in a crowd of people." W-what is this store? Assassins-R-Us? Most disconcerting line in the whole book. -- "You have guests," the butler informed them. / "What the devil?" Jack said. / "Yes, my lord. Precisely." I love butlers like this. Favorite minor character archetype: Discrete, Sassy Butler. -- "[I knew I loved you] when I was trying to remove your coat and you were abusing me thoroughly." / "It seems I spend a lot of time doing that." / "You do. And I have no idea why I put up with it. It is one of the great mysteries of the age." -- "Freddie was evil and conniving. She should have known that when he insisted on sending Joey to Eton." Because sending away your sibling to an esteemed boarding school for boys of his age and rank to receive a respected education is the height of villainy. -- "How can you have allowed things to come to such a pass?" / "[He] is Italian..." / "Oh, Italian! I understand." -- "Don't you dare change. What makes you think that after surviving this fever and a devilish wound, I want to die of boredom?" At least he's got his priorities right!